In 2004, presidential candidate John Forbes Kerry was the anti-war Left's great hope for peace. Today, as US Secretary of State, he is one of the loudest voices for launching an aggressive war against Syria. Astrology has a few things to show us about his political bent and his malleable sense of ethics. Kerry's economic indicators are mixed but lean Leftward. The South Node is in the Second House of finance. Venus in Scorpio has two rulers: Pluto, which is conjunct the North Node (moving him a bit to the Right) and Mars which is trine the South Node (pulling him back to the Left). Persons both Left and Right can have Left-wing economic indicators. The tie-breaker is the cultural affiliation. Here, we have an elevated Neptune (as does Barack Obama), tightly square Mercury, ruler of the Moon: a cultural liberal. The IC is trine the North Node, which by itself might make him more conservative, but when a cultural-liberal indicator is present, the effect of the North Node for this purpose is usually overwhelmed. Kerry's Pallas configuration, indicating ethics and placement on the libertarian-to-authoritarian scale, is complex. The tight Pallas-Mercury square is a strong libertarian factor and accounts for Kerry's youthful anti-war activism. From there, it gets murky. 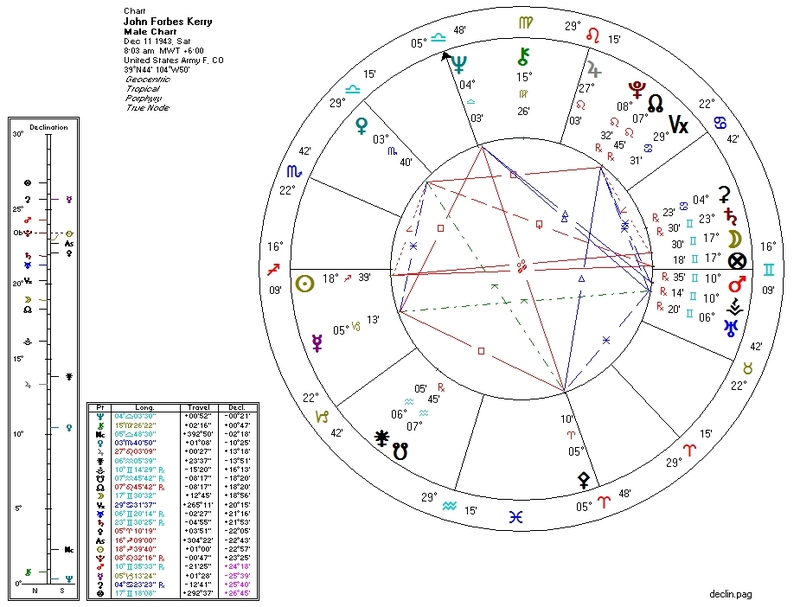 The North Node trine Pallas is normally a strong libertarian factor, but here the North Node is tightly conjunct Pluto, a strong authoritarian factor. Pluto is also sextile Mars, ruler of Pallas. As Kerry grew older and his North Node expressed itself, his Pluto overwhelmed his Pallas and the peacenik became a supporter of war. It's likely that even if he were elected President in 2004, he would have betrayed his anti-war base and sustained the wars he promised to end. This is exactly the outcome we have with Barack Obama, who has obliterated any claim the Democrats have to caring about peace. A decade ago, during the early stages of Iraq War II, a photo made the rounds of the internet showing Donald Rumsfeld shaking hands with Saddam Hussein. It highlighted the hypocrisy of the Bush regime regarding its Iraq policy. There is a more recent John Kerry version from 2009: John Kerry chumming with Bashar Assad. Assad, unlike his father, is actually relatively benign as far as heads of state go -- this makes Kerry's duplicity somewhat more sinister. John Kerry has recently spoken of "moral obscenity" on the part of the Assad regime. It would seem that the "moral obscenity" is actually Kerry's.